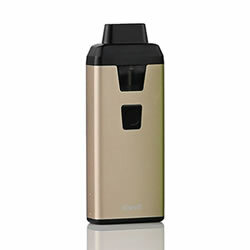 Eleaf iCare 2 - GOLD kit buy from NUCIG UK. The Eleaf iCare 2 AIO (All In One ) Kit is a ultra ultra compact/stealth starter kit perfect for beginners looking for a lightweight setup or for those looking for a backup on the go. The iCare 2 features an exquisite rubber paint finish, giving you a softer and smoother feel in hand than ever. The tank can be refilled with ease simply by removing the mouthpiece. To activate the device simply press the button and vapor will be produced instantaneously. The intuitive four color LEDs are for ease of checking battery status. The Eleaf iCare 2 AIO kit has an internal battery + tank combo - perfect for beginners looking to start vaping without being overwhelmed thanks to its one-button design and built-in battery/tank combo. This eleaf iCare 2 AIO kit comes with a micro USB charger and a total of 2 heating coil heads. The battery has 650mAh capacity which powers out with the 1.3 ohm coil. The coil also uses Japanese organic cotton wick material for a fuller flavour vape and satisfying cloud production. A 2ml capacity, which uses replaceable heating coil heads. Small enough to carry around and produces very good smoke. Easy to use and simple enough to refill so all in all a recommended kit! very compact, easy to refill and super for stealth vaping ! I like the kit because it is very compact and easy to carry around - always there when I need it. Its light weight and very portable, the vapour produced is very good for a device of this size.